Fizz Knits: No need to rush out and try to find another ball! After me worrying about having enough yarn left to complete the wee baby wrap-over top, I made it with a bit to spare. Thank you Bronte for your suggestion about using an alternative yarn to do the edging, if I had run out I would have given that a go. 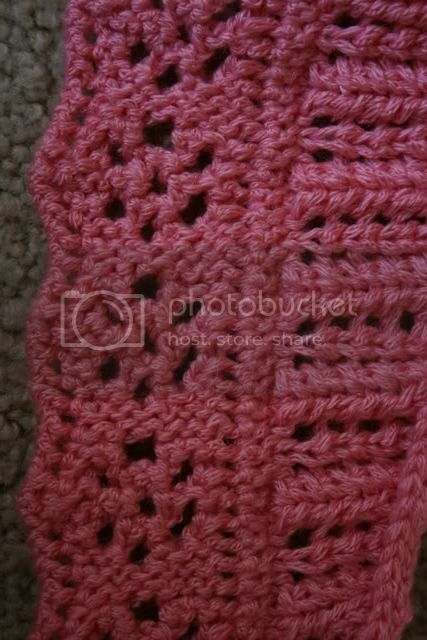 The yarn is Louisa Harding Kashmir DK and the pattern was from Patons 'Sugar & Spice ' Booklet. The pattern was meant for a cotton yarn but I am very pleased with how it's turned out. I still have to add some ribbon ties but haven't bought the ribbon yet. It might be hard to get a decent match as the colour is quite unusual. Also, while I'm on, here are a couple of finished items that I haven't got round to posting yet. First the Sirdar Blur Bolero for DD. It took less than one ball to make. I do like Blur, I've made DD a hat out of it before. However, it's a nightmare to rip back when you make a mistake and for some reason, although the Bolero is a very straightforward pattern I kept mucking it up and having to take it back. So I'm glad it's done! Also - a final picture of my felted bag. Made in Twilleys Freedom Spirit in colourway 'Force'. I'm quite pleased as it was my first felting effort though the flap-over bit turned in a wee bit and felted to itself round the edges. Hopefully it is cunningly disguised by the frill! 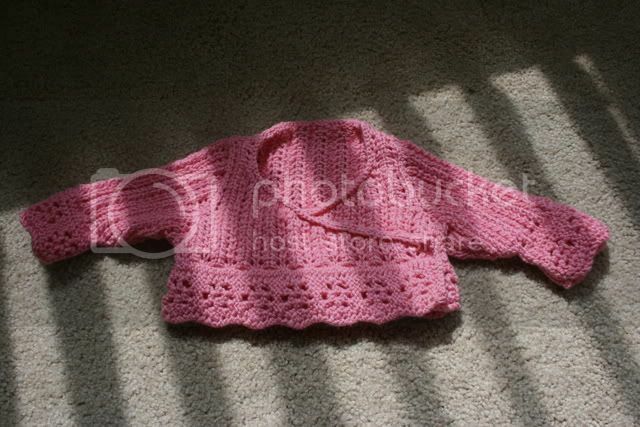 It's a gorgeous little cardigan. 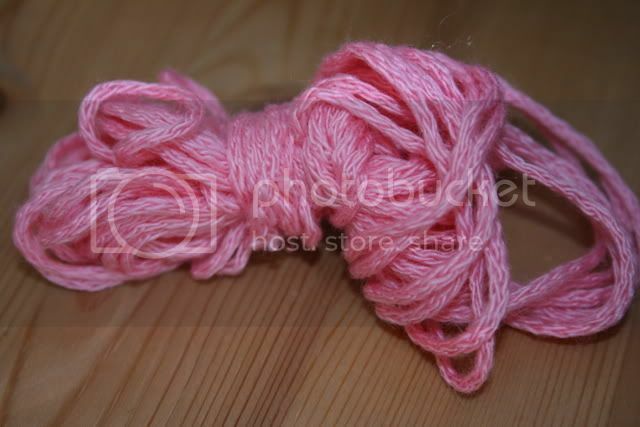 The yarn is gorgeous - I have some of the aran version to do something with.